buy an AR-15 onlineFirst manufactured by Eugene Stoner for Armalite in 1958, the AR-15 was a lighter 5.56X45mm variation of the 7.62X51mm AR-10. Because the AR-15 was more lightweight than the AR-10, infantrymen could carry a larger number of rounds. Fun Fact: The AR in AR-15 or AR-10 stands for Armalite, not for “Assault Rifle,” as some assume. Colloquially referred to as “the gun used by the United States military,” the AR-15 is the civilian semi-automatic version of the M4, which is fully-automatic and which is used by the U.S. military. Most often the AR-15 is chambered in .223 Remington or 5.56mm NATO. In basic terms, you get one PEW! when you pull the significantly slower trigger of the AR-15 once as compared to the 3-round burst—PEW! PEW! PEW!—when you pull the trigger of the M4 once. The M4 also has a full auto option, which will fire until the user lets go of the trigger. Before we go into the 8 best AR-15s for the money, let’s discuss what’s so great about the AR-15. If you already own an AR-15, you likely purchased it for one or more of the following four reasons. If you’re looking into buying an AR-15, the following four reasons illustrate why you ought to consider getting one. And depending on your needs, you might even have a fifth reason for purchasing an AR-15: for home defense. For some people, an AR-15 would be a strange option for home defense, but for others, they swear by it. Did you know you can buy an AR-15 online? Unlike the well-known AK-47, the AR-15 has a manageable recoil, especially when chambered in 5.56 rounds. The AR-15 also has great ergonomics and is designed for accuracy. The T-shaped charging handle does not require much force to pull back, so it’s simple and easy for even smaller individuals to use. Although occasionally you will read opinion pieces in the news like Gersh Kuntzman’s piece in the New York Daily News in 2016 where he described firing an AR-15 as horrifying, menacing, and very, very loud, almost everyone who handles an AR-15 loves how smooth it fires. One example is a 130-pound woman who wrote for The Federalist described firing an AR-15 as comfortable and therapeutic. Because the AR-15 is customizable to you, it’s great for adding parts to make it best fit you. At the same time, once you learn to fire one AR-15, you can fire them all. The weight is never going to be a problem as the majority of AR-15s weigh seven pounds while some lightweight models weigh even just five pounds. Finally, the recoil is very manageable for those who are recoil sensitive. You have so many different options with an AR-15. If you buy a complete AR-15, you can add the extras you want to suit whatever needs you have. You can also buy a parts kit and design your AR-15 exactly as you want it. It can look however you want it to look, and you can design it with a specific purpose in mind like home defense. Very few guns have this ability to swap out parts, or “furniture.” In fact, the AR-15 is the most customizable firearm available in the United States today, even more than the 1911. Look through any gun magazine, and there are pages upon pages of AR-15 accessories and parts. For example, type in AR-15 parts into Google, and you’ll get over 200 million results. Similarly, Brownell’s has a catalog of AR-15 parts that is the size of the Yellow Pages. Anything you can dream up, you probably can find! The fact that the AR-15 is primarily composed of two segments—the lower receiver and the upper receiver—gives it a variety of advantages. When observing these benefits, people often refer to the modular design of the AR-15, which simply means that a system can be easily divided into smaller parts—modules—that can be used in different systems and independently created. What this means for you is that you have quite a bit of flexibility with your AR-15 due to its modular design. First, it’s easy to clean and maintain as well as field strip and reassemble. If you’re really proficient, you can probably do it blindfolded, and you can probably do it in just a few seconds. Second, you can customize the AR-15 to a specific purpose. It could be a hunting rifle (if you use a larger caliber barrel), a high-precision rifle, or a Close Quarters Combat (CQB) carbine just by changing out the upper receivers and barrels. If you’re designing the AR-15 for a child, you can also replace the upper receiver and barrel for a .22 caliber. Finally, because the only the lower receiver is the serialized firearm, you can purchase several different upper receivers to match to your one lower receiver, and you don’t need any additional paperwork. A lot of service members have at least one AR-15 due to its similarity to the M4, the fully-automatic rifle that the United States military uses. Often service members will design their AR-15 to look exactly like their M4, adding on the same scopes or other features their military rifles have. Many service members want their AR-15s to almost exactly replicate their M4s at work because when they go target-shooting, it will give them additional practice on a rifle that is almost the exact same as their gun at work. Obviously, there are two major differences between an AR-15 and a M4. First, the barrel of a M4 is 14.5 inches, while the legal length for a civilian rifle must be 16 inches. Thus, some service members will add a 1.5-inch flash hider to make the barrel legal. When something is permanently affixed to a firearm like a flash hider, it becomes a permanent part of the firearm legally and thus the rifle now has a 16-inch barrel. Related Read: Service Rifle Competition Shooting. Because the AR-15 is so customizable, you can spend under $1,000 or over $5,000 on your AR-15. If you’re looking for your first AR-15 or if you want another one but can’t spend too much money, below you’ll find the best AR-15 rifles for those on a budget without a compromise in quality. Why We Picked It: At roughly $1,000, the ArmaLite M-15 A4 Carbine is reasonably priced for an AR-15, and you’re not going to compromise in accuracy. It’s great out to 100 yards with slightly under one-inch groupings with some of the best ammo and 2.5-inch or lower groupings with some of the cheapest ammo out there. The ArmaLite M-15 A4 Carbine is a much more than an entry-level AR-15, but at an entry-level price. For a couple hundred dollars more than the cheapest AR-15, you get a chrome-lined barrel and an all-forged alloy receiver, which are both high quality. Its weight is really the slight issue, but that should be easy to stomach with 1.5” groupings and amazing heat stability. Since the ArmaLite M-15 A4 chambered in .223 Remington is a carbine, it has a shorter barrel length (16 inches), which might be more comfortable for smaller individuals and which is definitely better for close quarters. Because the entire 16-inch barrel is rifled—M4s, for example, have an over-bored barrel 1.5-inch extension for legal reasons, the M-15 has a leg up on the civilian clones of the M4 in accuracy and velocity. The ArmaLite carbine fires great at 100 yards with an average of just under one-inch groupings with the expensive Black Hills’ 68-grain Heavy Match HP ammo and around 2.5-inch groupings for the cheap Russian TCW (55-grain FMJ) ammo with a scope. Others had more success with the 55-grain FMJ with 1.56-inch groupings at 100 yards. Obviously, how accurate a firearm is will vary from user to user, but the ArmaLite M-15 A4 has excellent accuracy for an entry-level rifle. One user observed how his greater success with the cheaper and more lightweight ammo seems to suggest that the M-15 might be better with lighter-weight bullets, which is good! It means cheap and readily-available ammo! Another great aspect of the M-15, which contributes to its accuracy, is that it is not very sensitive to barrel heating and cooling in comparison to other tactical carbines. That means that your groupings will only deviate 0.2” or less when the barrel heats up or when it cools back down. Some have noted that they would prefer a lighter weight and a better trigger, but that it worked well for accuracy without any additions besides a scope. Others were fine with the trigger, but found the weight a little heavy. Sometimes this rifle can have issues chambering, even scratching some bullets slightly. One user sent the rifle to ArmaLite for repair, and while it didn’t any issues with the feed ramp, it wasn’t completely smoothed out, still scratching—albeit less noticeably—some bullets. For that user, however, he just wanted some additional time on the range to confirm that the gun was reliable, and he said that he thought it was. It went through 600 rounds without any issues, and he said he’d be ready to pronounce it 100% reliable once he had gone through 1,000 rounds with no issues. Although the charging handle is ambidextrous, the M-15 is not really for lefties as the mag release is on the right side. But for those who are right-handed, the M-15 is great because it has all the controls in the standard AR positions. As one user noted, the M-15 is built to last and built to shoot. You’ll have amazing accuracy and very little recoil. No need to buy a cheapo M4 when you can get the M-15 for a very reasonable price without a compromise in accuracy. It’s also one of the better defense AR-15s out there and would double as a great home defense weapon. Why We Picked It: The BCM Mid-16 Mod 0 is a great AR-15 on a budget because it’s a lot of gun for the money. It is a top-tier AR-15, but at a low-tier or mid-tier price. Geared toward tactical applications, the Bravo Company Manufacturing (BCM) Mid-16 Mod is an excellent choice for an AR-15 for those on a budget because it comes with a lot of BCM upgrades (charging handle, flash hider, grip, hand guard, QD end plate, stock, and trigger) at an excellent price. One user noted that the Mod 0 is the equivalent of a rifle that costs at least $500 more, and the Mod 0 also has BCM upgrades. The Mod 0 is a solid, quality rifle. If you’re looking for a mid-length rifle as opposed to a carbine, the BCM Mod 0 is the best choice for an AR-15 that isn’t going to break the bank while at the same time being an extremely well put together rifle. The fit and finish are top-notch, and all of the parts are high quality. Some people have observed (while still considering the rifle one of the best on the market) that the upper and lower receiver fit is not as tight as a Daniel Defense, but that it is still more than adequate. Why We Picked It: Still used by law enforcement units, the Colt LE6920 M4 Carbine is an excellent gun for the money. Known for its accuracy and performance, the LE6920 has proven combat power. If you find the Colt LE6920 on sale, it’s an absolute steal. The LE6920 is light and mobile and quickly secures targets, featuring many of the advantages of the military Colt M4. If desired, the LE6920 is also available with a step-cut barrel so that it can accept a grenade launcher for non-lethal options. You can rely on the LE6920’s accuracy. Due to its dual aluminum shielding, it has heat protection, meaning that the heating or cooling of the rifle will not drastically affect groupings. It also comes with a Magpul MBUS backup sight. You can also trust Colt, as it is one of the longest running contractors to the U.S. military, to create a superb rifle. Some note that it isn’t the lightest rifle, which is true, but you can’t beat the price. Knowing that you can get an accurate and reliable AR-15 for under $1,000 that is trusted and often used in law enforcement and military operations is worth the little bit of extra weight. The LE6920 is an excellent entry-level AR-15, or, if you already have one, it’s a great additional AR-15 to plink with. Why We Picked It: A fine piece of machinery and craftsmanship, the Daniel Defense M4V1 is a superb option for those new to AR-15s and those who are more familiar alike. While you’re going to spend more than a budget AR-15 on a M4V1, you will not regret the quality. The M4V1 is worth way more than you will end up paying for it. Daniel Defense is known for making top-of-the-line firearms, and that’s going to be reflected in the price. At the same time, if you’re able to spend a little bit more, they are definitely worth it. The original Daniel Defense Rifle, the DDM4V1 is one of the best choices for a 5.56 weapon/AR-15. It is not going to fail you. The buttstock and pistol grip are comfortable and easy to shoot, making it great for a someone new to AR-15s. You can’t go wrong with a Daniel Defense, as it is a top-tier manufacturer that produces almost 100% reliable guns. If you don’t want to worry about the quality of your new AR-15, especially if you want to use it for home defense, start off with the DDM4V1. It’s also definitely on the lighter side, if you’re a smaller individual and need something that isn’t going to be really heavy. Many people consider it to be one of the best AR-15s they have fired and have observed that it is dependable, even if you use really cheap Russian ammo. On the flip side, Daniel Defense has the quality, but it is definitely on the pricier end. But if you want to/can spend the money, it is well worth the price. It has the accuracy and performance of AR-15s at least $1,000 more expensive. The word often used to describe it is “reliable.” You will have mild recoil, great precision, and 100% reliability. If you’re one of those people who are skeptical about spending over $1,000 on an AR-15, think again. One user noted that his M4V1 helped him to become a better shooter and that it’s even a bit awkward to use other AR-15s now that he has used his Daniel Defense. Another user noted that he had owned Colt, Bushmaster, Smith & Wesson, and Windham weaponry, but none of them (even all put together) compared to the M4V1. If you’re looking at purchasing your first AR-15 and don’t want to regret dishing out money for a low-end gun that isn’t going to be great, the M4V1 is one of your best choices on the market. At the same time, it’s also a perfect advanced to professional rifle. Why We Picked It: The Rock River Arms LAR-15 Entry Tactical is a great entry-level AR-15 if you opt for the base model, but if you want to customize it, the LAR-15 is a great option too. A little bit more expensive than some of the other AR-15s on this list, the Rock River Arms LAR-15 Entry Tactical is an excellent option if you can afford to spend a little bit more. 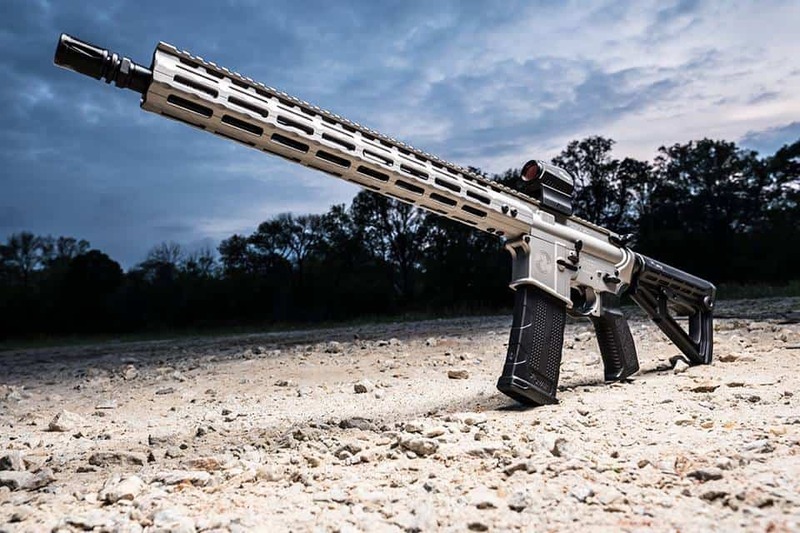 Although the company name isn’t familiar like Smith & Wesson or Sig Sauer, Rock River Arms has been growing in prestige in the AR-15 market since its inception in 1993. The base model starts around one grand, but you also have the option of customizing the rifle straight from the factory. If you’re a little bit more familiar with AR-15s, this is a great choice as you can create the AR-15 that meets your exact specifications. The LAR-15 has a hogue grip, an A2 flash hider, and an RRA two-stage trigger, which makes it accurate and reliable. A basic model AR-15 if you don’t customize it, the LAR-15 comes out of the box simple and ready to shoot. Why We Picked It: SIG Sauer is known for its quality firearms, and the SIG Sauer M400 Elite is just another example. Whether you go for the baseline model or you include a couple additions, you’re getting a lot of bells and whistles for a great price. And you know that this AR-15 will last you a long time because it has the SIG Sauer German engineered quality. Created to meet law-enforcement and military standards, the SIG Sauer M400 Elite is a reliable firearm. SIG Sauer is a well-known and reputable company in the firearms world, and it produces top-notch guns. As one user note, you can’t beat the quality because c’mon now, it’s a SIG. The M400 has some fancy components like the Enhanced SIG trigger that features 5.5- to 9- pound adjustment, which allows you to precisely dial in accuracy. Additionally, it doesn’t have iron sights on the basic M400 Elite, but you have the option of purchasing SIG’s ROMEO5 red-dot sight for just a little bit more and you can pair that with a red dot magnifier combo. In addition, the M400 Elite fires well and very softly. One down-side of the M400 is that it’s not for lefties, as it does not feature ambidextrous controls. But if you’re right-handed, you can’t go wrong with the M400 Elite. Just the baseline model comes with a lot of bells and whistles for a very reasonable price. The M400 is really nice, as it’s an AR-15 that doesn’t break the bank without compromising in quality. Built to perform, the M400 delivers on all counts. People in the firearms world know that they can trust a SIG, and the M400 is no exception. Why We Picked It: The Smith & Wesson M&P Sport II is one of the best affordable AR-15s on the market. It’s a quality firearm for a reasonable price. If for some reason, you can’t spend a lot of money on an AR-15, the Sport II is the way to go. For the money, the Smith & Wesson M&P15 Sport II can’t be beat. It’s a great price even when you have to pay full-price, and when it’s on sale, it’s quite the steal. For an entry-level AR-15, you can’t go wrong with the Sport II. It may seem like it’s really cheap, but it’s an excellent quality firearm for the money. You can read about countless people who have shared on the internet about the success they have had in firing the Sport II. You don’t have to throw a lot of money at an AR-15 to be really satisfied with the performance. You’re not going to get M203 barrel cuts, less than a 1 in 9” twist, or dust covers, but for most people, especially beginners, that’s not going to matter. Smith & Wesson designed this rifle to be an excellent firearm for those on a budget, aimed at the average range-goer. If you’re not sure what exactly you need in an AR-15 but want a quality firearm, the Sport II is going to be a great basic gun. You can read review after review online, and hardly anyone ever says anything negative about the Sport II. Instead, they always rave about the Smith & Wesson quality and the out-of-this-world price. While this might not be the best AR-15 for someone more experience—unless they want to add to it and custom it or if they wanted another cheap, but great AR-15, the Sport II is the go-to gun for first-time buyers. One of the most affordable AR-15s, the Sport II is one of the best options for a first AR-15. Dependable under variety of conditions, the Sport II is reliable and versatile, making it the ideal modern sporting rifle. It shoots perfect out of the box and can fire almost anything that you feed it. It’s also lightweight, which makes it comfortable and easy to fire and handle. If you’re looking for one of the best prices on the market without getting a dud of a gun, the Sport II is almost certainly the best option for an AR-15. A variety of users have mentioned how great the Sport II is for the price and also that you have a great starting point with the Sport II to customize it to your wishes and desires. Why We Picked It: An excellent choice for a mid-level AR-15, the Windham Armory R16M4FT will perform great at 100 yards and has an amazing build construction for the price. For those who are new to the AR-15 world, it also has indicator markings on the receivers, making it a great first AR-15. The Windham Armory R16M4FT is a great rifle for the price. It fires like a dream, as it is accurate and has small groupings. It has the build construction of a gun twice its price, making it one of the best AR-15s out there. For the price, the R16 has a great fit and finish. At 100 yards, it will perform very well and shoot dead on every time. It’s a little bit more expensive than some of the cheapest AR-15s, but it’s one of the best mid-level AR-15s out there. In fact, it’s become quite popular because the rifle is lightweight with a mild recoil, and it has excellent accuracy and a great trigger given the price of the firearm. If you’re looking into getting an AR-15, the Windham Armory R16M4FT is a great place to start. If you’re not used to handling an AR-15, the R16 has indicator markings on both sides of the receivers. As we noted above, an AR-15 is an amazing rifle: it’s comfortable, customizable, practical, and similar to the M4. Whether you’re looking for one that shoots .22 for your kid or .50 Beowulf if you want a really large caliber, you can find it in the AR-15. And if you’re looking for an AR-15 on a budget, we’ve got you covered. Hopefully, now you have a better idea from our budget buyer’s guide for the 8 best AR-15s which AR-15 is going to be your next! If you enjoyed this article, please share it with a friend. You’ll likely also enjoy this article on the best AR-15 soft cases on the market. Introducing Michigan Open Carry, Inc.